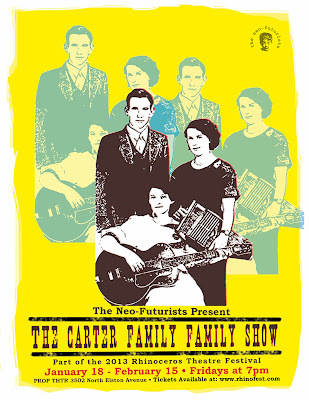 The Neo-Futurists present, The Carter Family Family Show, written by Emmy Bean, Joe Dempsey & Chloe Johnston and directed by Chloe Johnston, as part of the 2013 Rhinoceros Theatre Festival. A.P. Carter. Maybelle Carter. Sara Carter. The original family of country music. In the 1920s and 30s, audiences across the country huddled around the radio to listen to classic harmonies of well-loved songs such as “I’m Thinking Tonight of My Blue Eyes,” and “Will the Circle be Unbroken,” being broadcast from a Mexican radio station just across the border. The songs they sang only hinted at the romantic travails and musical adventures that these singers lived. The Neo-Futurists present three solo pieces inspired by the lives of these musical pioneers, featuring a different musical guest every night.